As Western Canada’s largest junior mining & exploration conference, VRIC tends to pull in investors (both retail and institutional) interested in the companies in this sector. In keeping with years past, this year’s conference was a two-day affair and featured a number of great guest speakers, company presentations, panel discussions and exhibitors. Although attendance numbers were lower this year (~6000 investors, 2000-3000 exhibitor staff), many of the exhibitors were pleased with the crowd turnout. In addition to the mining crowd, two discount brokerages had booths at this event: TD Direct Investing and Disnat (now Desjardins Online Brokerage). Unlike year’s past however, there were no really big conference promos although TD Direct Investing did have a draw for 2 hours of investing lessons 1 on 1 with one of their reps.
A few noteworthy additions for this year included a couple of pavilions. The “Yukon” pavilion was abuzz with events and keynote speakers highlighting business development opportunities in the Yukon. 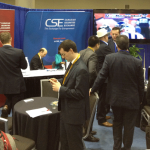 As part of their rebranding campaign, the Canadian Securities Exchange (formerly the CNSX) had a very busy pavilion owing to the combination of some feature CSE listed companies, a big screen TV and an impromptu tailgate party during the Seahawks & 49ers game. 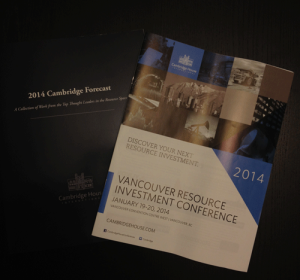 A great little guide was also produced this year by Cambridge House which contained the forecasts for 2014 from 18 thought leaders in the resource space. In addition to mining companies, media & analysts, there were a variety of organizations exhibiting covering everything from corporate social responsibility to crowd funding. Many attendees, exhibitors and speakers appear to agree that times for junior mining companies are bad. As one mining company executive waiting in line for the conference said, “we’re hanging on by our fingernails.” The attitude amongst company owners appeared to be, “if we’re fighting that means we’re not dead.” Whether it’s resilience or denial, the mood amongst companies is to ‘hang on’ for as long as possible. For investors in these companies, the case for mining and exploration companies spending valuable cash can seem somewhat tenuous. On the one hand, if they’re not working with the cash, what is it doing? On the other, the timing for pushing forward on certain projects just doesn’t make economic sense. The market seems equally as disoriented. For example, one mining company executive recounted when they announced that they’d shuttered their spending on exploration/development, they saw a bump in their share price. In a challenging market such as this one, the laws of the investment jungle apply more than ever. The strong will survive and the weak, no matter how ‘good’ the projects may be, will fall victim to either predators or circumstance. What was interesting about this year’s VRIC is that there was a mix of both predator and prey in the same room. Larger investors made no secret of their joy of being able to find undervalued and distressed assets. Analysts and guest speakers (even the usually bearish ones) also suggested that buying opportunities exist in quality companies/projects so long as you’re willing to do the homework to find them. Perhaps that was cold comfort to some of the strategically weaker companies. Still doing homework is part of the investment process. 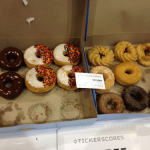 To that end, there were many analysts as well as several of the companies in the room, most notably Tickerscores, who have emerged with some interesting tools to help make the job of screening & identifying promising candidates substantially easier. One of the great tips from the Tickerscores presentation for those interested in the junior mining & exploration space was to question management about how much cash the company has (not just the cash from financing either) to ride out this storm. For investors, it is best to be aware that many company representatives report ‘sugar coated’ versions of events so be sure to do careful analysis of the company, ask management pointed questions and assess the sector before considering these investments. Despite the lower turnout, this year’s VRIC crowd was especially enthusiastic to hear popular analysts/speakers giving their reasons to stay out of or dip into these markets. While investors wait and watch to see what 2014 brings to the junior mining space, Cambridge House announced that investors can now also look forward to a tech investment conference (Cantech) being brought to Vancouver in June (June 12, 2014) shortly after the World Resource Investment Conference. Either way, for those still in the game by their fingernails, it’s going to be a long winter ahead.